Although what we hear is unsubstantiated, we understand that Bernie Ecclestone has given up all hope of Donington hosting the 2010 British Grand Prix and that he is on the verge of launching legal proceedings against Simon Gillett's Donington Park Ventures. Reliable sources inform us that Ecclestone has already been in touch with circuit owner Tom Wheatcroft to tell him that "it's all over", while construction company McAlpine is understood to have moved off the site on Friday. 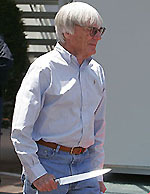 Having announced the deal with Donington on the opening Friday of the 2008 British GP weekend at Silverstone, earlier this year Ecclestone agreed to a 10-year extension to the original 7-year deal. While Ecclestone is understood to have been hoping for a 1-year deal at Silverstone for 2010, a deal which BRDC president Damon Hill is understood to be rejecting, if the talk of legal action is true Ecclestone may have finally realised that Donington needs to be written off once and for all. US F1 car in "construction phase"